The Jewnion Label is a fun online store filled with clever Jewish-centric paraphernalia. It’s back-ended by CafePress. The founders, Stacey and Joshua Abarbanel of Santa Monica, Calif., created emblems honoring a wide range of unsung heroes, including latke flippers and Jewish mothers. All of these designs can be put on the usual Cafe Press fare of shirts, sweats and mugs. Each emblem highlights a guild or society with a motto. For example, the Purim Shpielers & Squelers Society’s is “Shake, Rattle and Role.” The names of the Purim story characters are wrapped around the main design. Really clever. 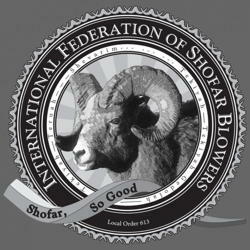 I purchased a t-shirt for the International Federation of Shofar Blowers, since I am BIJ’s Ba’al T’kiyah for the High Holy Days. The blasts of the shofar are translated into symbols of long dashes, short dashes and dots. This design is superb. The High Holy Days are a time of deep reflection, heartfelt prayers and renewal. At the same time, they can bring opportunities for new blessings and fresh connections to our spiritual heritage, and perhaps, the creation of traditions for you and your family. Many of the High Holiday symbols and customs are familiar: the round challah, which represents a crown (we refer to G*d as Melech, “king,” in a number of prayers in the liturgy ); and the dipping of apples and challah into honey on the first day of the new year (adding the special blessing “to renew unto us a good and sweet year”). I note that a number of my B. Mitzvah students have trouble with the “ch” sound of the “chet” and “khaf,” even those who attend a Jewish school with plenty of Hebrew. They make it more of a aspirated “h,” rather than a nice strong “ch” sound. And yes, I know about the pronunciation difference between the chet and khaf, the latter getting the IPA symbol that looks like an X. I encourage a stronger, more forward “ch” sound for both letters when chanting. Perhaps this predilection for the “h” comes from longstanding Hebrew Academy transliteration rule for “chet” of using an “h” and a diacritic mark underneath, a line. This could be confusing to some people and sends the wrong visual cue. I understand it for library and academic purposes where we want to get some semblance of the actual Hebrew spelling from the English letters. But for saying the prayers? Yes, the students should stick with the Hebrew, but sometimes eyes stray. It creates a visual ambiguity. My eyes prefer the “ch” transliteration rather than the “kh” version. But either is better than the “h” Hebrew Academy version. This is the teaching and guided meditation that I offered in January at Congregation Beth Israel Judea’s Sacred Hebrew Chant & Drum Service for Shabbat Mishpatim, 24 Sh’vat 5771. “The mystical text the Zohar tells us that G*d says to every human being every day “go forth,” begin the journey that is yours to make. “What makes us enlightened is that we are not afraid to wander. Doubt is a prerequisite for any meaningful journey. When we can acknowledge the built-in anxiety rather than maintaining the illusion of certainty, we become humble — which in turn creates a new and more authentic confidence. “What if we understood that all decisions, even the seeming sure things, are leaps into the unknown? What if we were galvanized, rather than paralyzed, by uncertainty? First, is a fact that he says American and EU politicos won’t admit: that there’s no will for peace on the Palestinian side, even from the “moderates.” He says this rejectionism is ignored by most Western observers. … Palestinian political elites, of both the so-called “secular” and Islamist varieties, are dead set against partitioning the Land of Israel/Palestine with the Jews. They regard all of Palestine as their patrimony and believe that it will eventually be theirs. In an L.A. Times opinion piece in late June called a A Huge Word Made Small, Rabbi Marvin Hier of the Simon Wiesenthal Center wrote about the misuse and overuse of the word “holocaust.” It is being used willy-nilly for any terrible event or injustice or even a sporting even, which then devalues the word and the Shoah. Wiesel is right. There are many injustices and manifestations of evil in our world, even in our own country, the greatest of democracies. Standing up to them is not only our right but our obligation. But that obligation does not include distorting and demeaning the word that has come to stand for the great evil that was the Holocaust. The Holocaust was a total eclipse of humanity. It was not about going to the back of the line or eating in a different part of the restaurant or being escorted to the border without recourse. The Holocaust had one purpose: the total annihilation and extinction of a race. The ADL recently said it would not support the establishment of the Cordoba House, an Islamic Center that would include a mosque located 2.5 blocks from Ground Zero in New York. This decision is just awful and shows zero backbone. I am very disappointed. A friend recently sent an email message to a group of us who worked as counselors-in-training many years ago at Camp Swig (a Jewish summer camp in California). The message included a link to a video from Jihad Watch against the Cordoba Institute. at Hebrew Union College. He wrote the book An Introduction to Islam for Jews and others. The video you received about the Cordova Initiative is outrageous bigotry. It is full of lies and is in essence an antisemitic diatribe, but directed toward a community that is the state-of-the-art scapegoat for this decade. Just substitute Judaism for Islam and Jews for Muslims and you will find the typical antisemitic screed that was broadcast on the radio in Germany and occasionally in the US during the 1930s.